He did not have to wait long. His daughter had high fever and could not sleep the whole night. In the morning instead of taking her to the witch doctor, he took her to the preacher. He prayed for her and very soon, her fever left her. He went home and told his extended family and also his neighbors about what had happened. Two days later, the preacher visited them again and offered to start a prayer meeting regularly if they were okay. All of them were delighted. He would sing, pray and preach and then pray for the sick. One after the other, all of them were healed. On invitation, they began to attend church about 15 kilometers away. Each week there was a group of men and women walking to church from Nani Saroli. There was a fire in Mitha’s heart. If this could happen in another village, why not in my own village? He asked the pastor to come to his home each week and start church. It proved to be a blessing. His house was soon packed with people, more than could be accommodated. One service, the pastor laid hands on Mitha and asked him to pray for the sick. He could not believe it. But people began to be healed. Then he began to lead the songs during the service. Then one Sunday, the preacher could not come and Mitha had to lead the church by humself. God gave him the words to speak boldly. He knew he needed to learn the Word and so he kept going to the preacher and studying. God gave him wisdom and he began to pray in the Spirit to get new understanding of the scriptures. This is the house where they were meeting for a year. In one year, 46 people took water baptism. The next year another 23. People were sitting outside peeping in to be part of the service. Last year, he declared in faith that they needed a hall where they could sit and worship and also accommodate more people. Right there he challenged people to give their time and money towards this dream project. They raised Rs 40,000 and last year invited the leadership for a ground breaking ceremony. 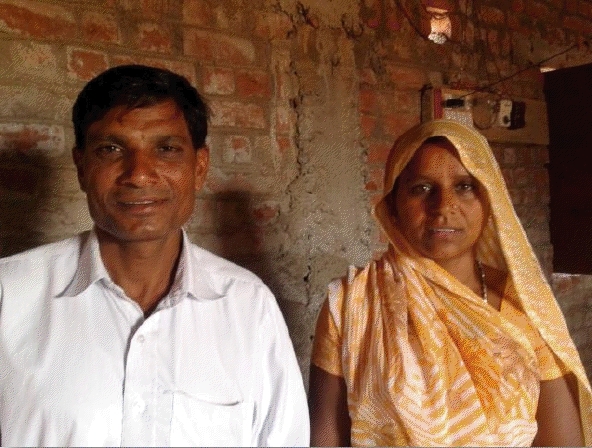 When all were skeptical, Mitha knew what he was doing because he had heard the Lord. Now the roof has been laid, but the building awaits plaster, flooring and painting. He also owes an amount to the shopkeepers. With over 100 people worshipping Jesus, it is almost a holy confusion on a Sunday morning. People praying, women singing, children sleeping in makeshift cribs before Mitha begins to pray and start the service. And then there is no stopping him. A help of Rs 200,000 will complete the building and also provide fan and mat inside the hall. Here Mitha proudly stands in front of the hall knowing that God will provide and complete what He has promised. Would you pray and help finish this assignment from the Lord?